The Panasonic Lumix DMC-LX5 is one of our favourite premium grade compact cameras, which means our hopes for the nigh identical 10.1MP, 3.8x optical zoom Leica D-Lux 5 Titanium are as high as the price tag. Yes, owning a Leica camera with its famous little red dot logo costs a lot, with little concession made to market competitiveness. 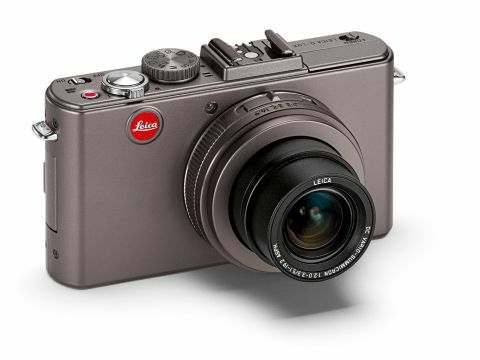 The silver-grey metal Leica D-Lux 5 Titanium is, however, still one of the least expensive cameras to bear the brand's hallmark, costing £855 in the UK and $1,195 in the US, compared to the £1,400 or $2,000 Leica X1. Leica also throws in a luxurious matching leather carry case. If the Leica D-Lux 5 Titanium still sounds prohibitively pricey, the regular Leica D-Lux 5 is a comparative bargain, at £650 or $800. Cheaper competitors include the Canon PowerShot S100, Canon PowerShot G12, Nikon Coolpix P7100 and Fuji FinePix X10. Like the Panasonic Lumix LX5, the Leica D-Lux 5 Titanium features an 11.3MP, 1/1.63-inch CCD sensor at its core, plus a bright f/2.0 maximum aperture that, along with an ISO range topping out at ISO 12800, suggests this is an able tool for low-light photography. The compact camera also captures 1280 x 720 pixels video at 30 frames per second (fps) in a choice of AVCHD or Motion JPEG formats, with a dedicated red record button above and to the right of the top plate. Both still images and videos are composed with the aid of the 3-inch LCD screen at the back, which offers a clear 460k dot resolution. A vacant accessory port just above the display enables an optional electronic viewfinder to be attached. A pop-up flash is sunk within the camera's top plate and manually activated by a thumb switch. As with the Panasonic Lumix DMC-LX5, we also get a vacant hotshoe on the Leica D-Lux 5 Titanium for an extra accessory flash.